Debra Hart is the author of the new book Call Him Mr. 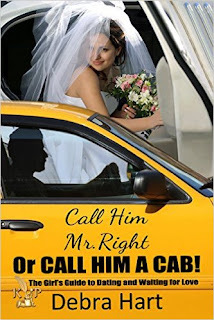 Right Or Call Him a Cab! : The Girl's Guide to Dating and Waiting for Love. She is a clinical auditor and real-estate investor, and she lives in Akron, Ohio, and South Florida. Q: You write, "I am a person who made a series of mistakes, and would like to keep you from doing the same." Why did you choose to write a book about relationships, and who do you see as the perfect audience for your book? A: I wrote a book about relationships because they tend to unsuspectingly steer the direction of our lives. Enter into the wrong relationship, and you can reroute your life in a direction that was never intended. Since dating is the precursor to the relationship itself, it is important to do all you can to prevent making mistakes that may rob you of the happiness you so seek. My hope is that women can learn from my mistakes, and take caution as they go about making life-altering decisions that will prove remarkable, not regrettable. The perfect audience for the book is single women of all ages and walks of life. It is for those who want to realize the purpose for their life, and at the same time, learn the truth about dating through a new process called Four Zone Dating. Q: In the book, you describe the idea of a "lifeline" for relationships. What are the important elements in a lifeline that can help a relationship work better? The lifeline is derived from the S.T.A.R.T. [Specific Tangible Absolutely Required Traits] signs that you personally choose, and set in stone. Meaning, these are the traits or elements you deem critical, and must be present in a person you would date. The S.T.O.P. [Stuff That's Obviously Poison] signs are the poisons you know will kill off the relationship. So, the success of the relationship doesn't necessarily stem around the elements themselves, but rather, that they are honored. My best advice is to be sure your P.R.I.N.C.E. (Potentially Right Individual Needs Complete Evaluation) fits the criteria; never change your criteria to fit him. Q: You ask the question, "How long should you hold out” for Mr. Right? What is your answer? A: For me, the answer is — until the day I meet him. Q: You write that you're not advocating that people get married at the one-year mark of their relationship, but that "no talk of marriage [at that point means] no reason to continue." Why do you see the one-year mark as especially important? A: Dating, as I define it, is a process of elimination used to find your prospective mate. And the person you are dating is considered to be a P.R.I.N.C.E. This evaluation process can take up to one year, which allows plenty of time to make realistic decisions. But, if someone has made it perfectly clear he does not want to marry you, the one-year mark averts you from spending another year or two hoping he will change his mind. Knowingly wasting those years is unknowingly rerouting your life. A: I'm working on a book that I hope will become a screenplay. I dream big! A: I would love to hear from my readers. If you have tried Four Zone Dating, or have been inspired to work on your Dream-within, please share your stories with me at my website.